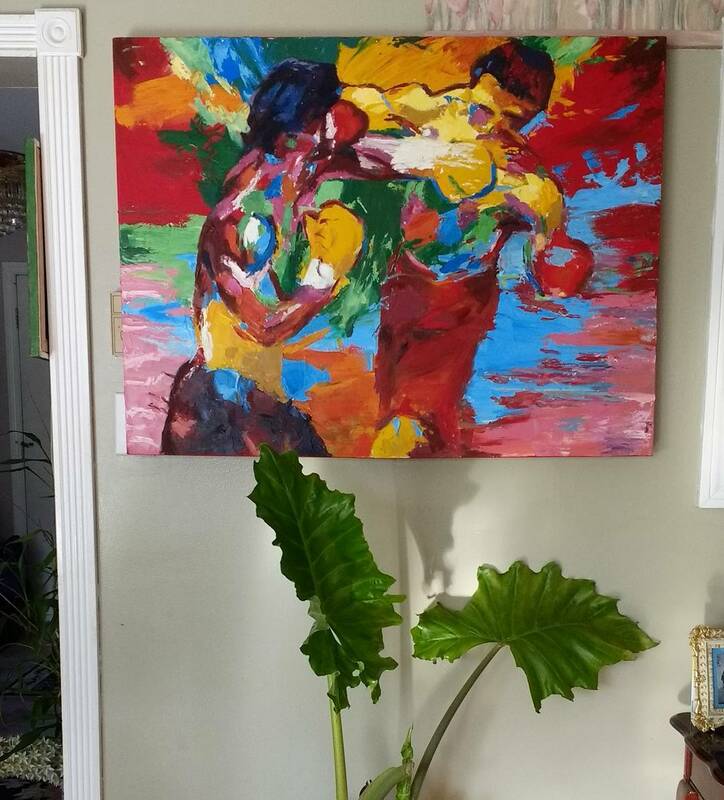 I received a request to paint a colorful expressionistic painting of Rocky vs Apollo by Leroy Neiman. The painting is shown at the end of the film, Rocky III when Rocky and Apollo have a friendly boxing match and the fighters freeze into the colorful Leroy Neiman painting. The style of painting is something that I have not tried before so I was ready for the challenge! 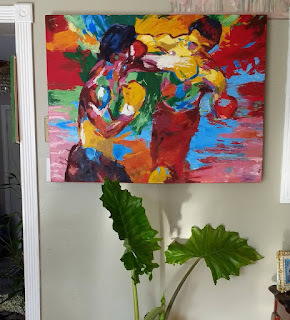 As soon as I was commissioned to make this painting, I pictured the technique that I would use to paint this image. Since this painting has a lot of motion I thought a pallet knife would certainly capture it. I started by mixing the most prominent colors in the painting. The painting is full of various shades of red. I mixed cadmium red with phthalo green to get a darker shade of red. I mixed cadmium red with cadmium yellow and so on.. Colors upon colors were certainly needed. 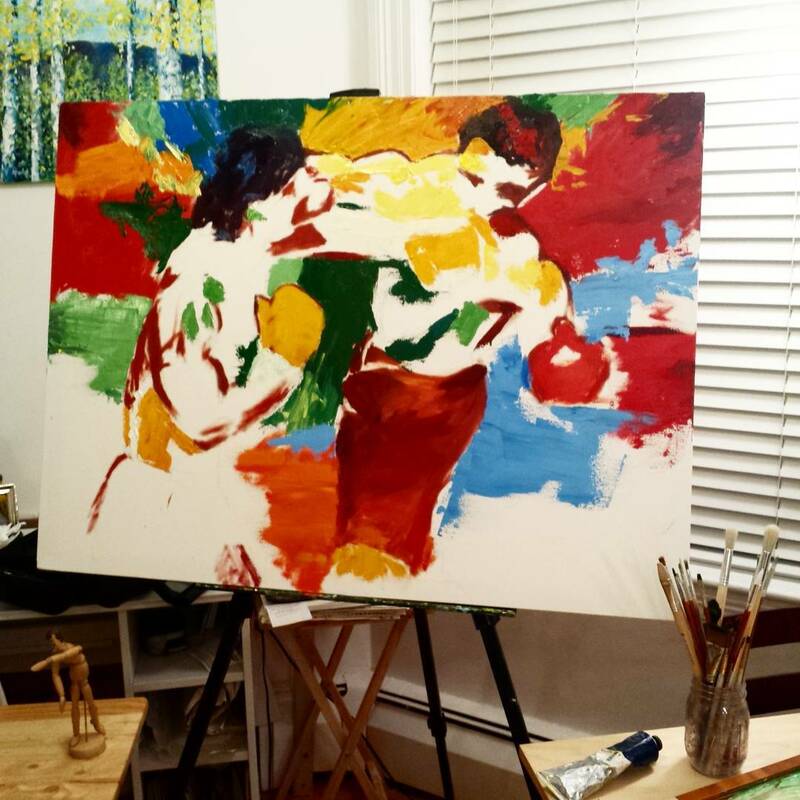 The color mixing took about an hour before I put paint on the large 30 x 40 inch stretched canvas. I also sketched out the scene so I can get the proportions correct. 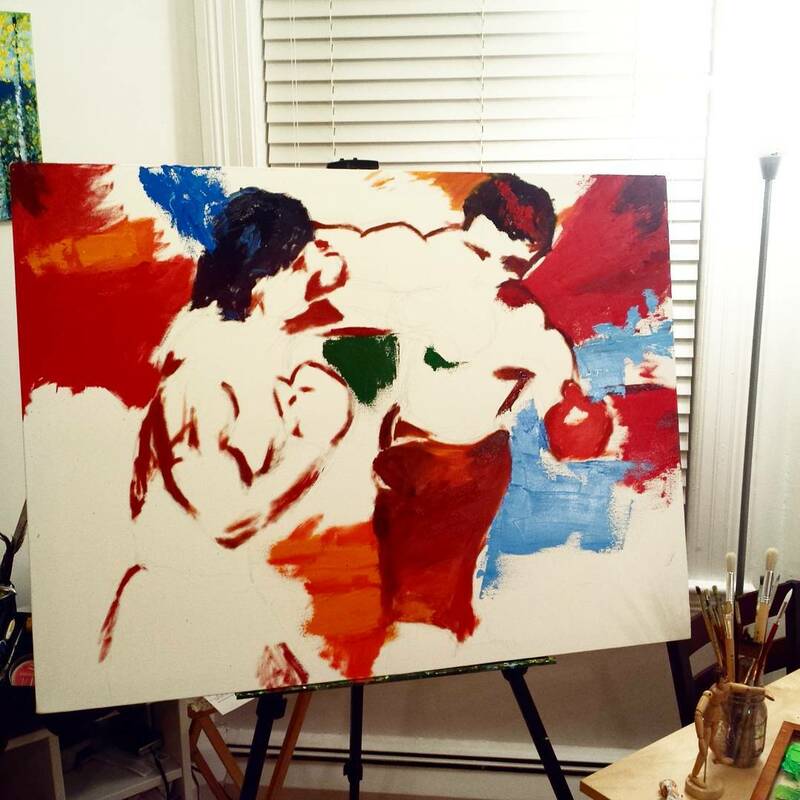 The painting slowly developed with dark red brush strokes forming the boxers. While painting, I tried not to fixate on one section but rather add paint on different parts of the canvas. This helps the painting evolve much faster. Nonetheless, I noticed that I worked from the outside in. Maybe I was intimidated by the different colors that formed the bodies of Rocky and Apollo. 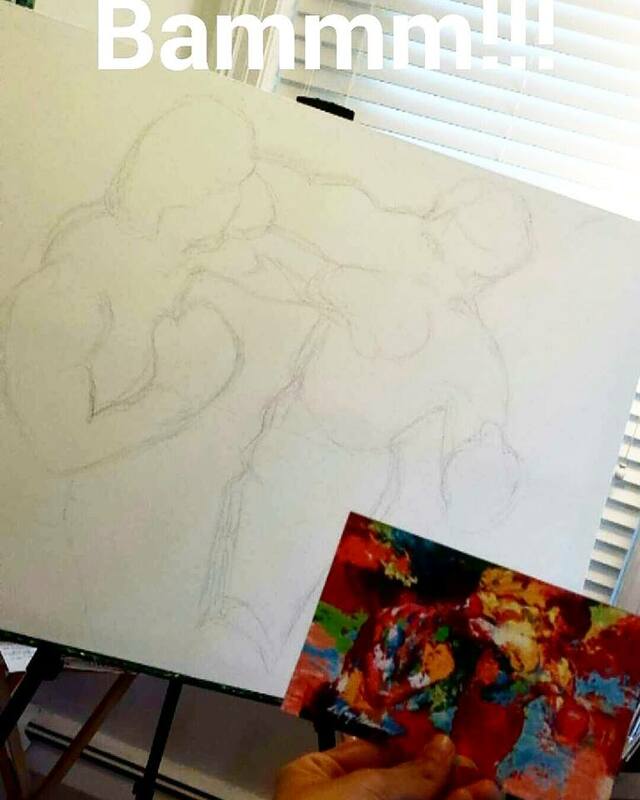 While reproducing Rocky vs Apollo, I learned that color mixing is very important before starting a painting. Although I planned ahead and mixed my paints beforehand, I did not use a lot of paint. Next time I will certainly squeeze out a lot more paint at the beginning so I don’t spend a lot of time mixing colors while I’m painting. The time spent color mixing was a surprise. Nonetheless, I got a lot of experience mixing colors with this painting. I have never used this much paint in my life! Reproduction paintings are like painting with someone else’s paint brush. Therefore, it's certainly a learning experience. It can push you outside of your comfort zone which will in turn help you develop and improve your own technique. 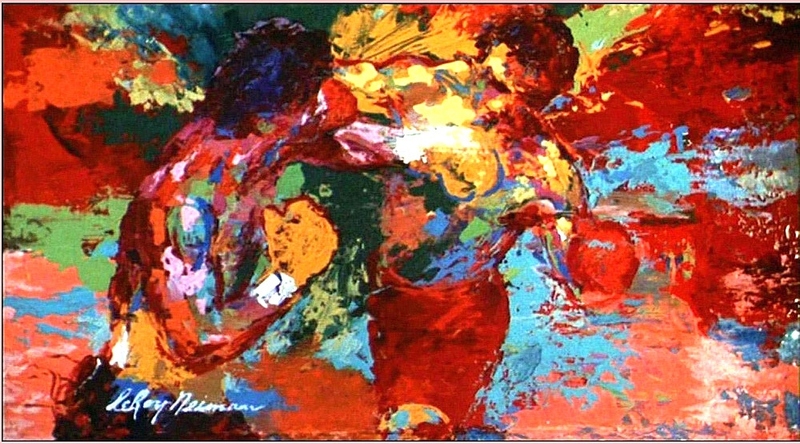 Even though I am very fond of realism, I can certainly appreciate Leroy Neiman's colorful expressionistic style.